One of the main lessons learned by astrology students is that there are no coincidences. The magnificent and precise planetary system explains what is happening at any given time, for whatever is born at any time has the qualities of that moment and time. History repeats every time Pluto returns to the same sign. Its previous position in Capricorn (1762-78) was during the first Tea Party of 1773. Pluto is back in Capricorn (2008-2024), and now we have the Tea Party movement that began with the election of President Obama in 2008. Religious connotations and other unforeseen factors concerning both Tea Party movements, including the connection to the GOP, are clearly reflected in the birth charts. For a better understanding it is important to first explore some background history. The name “Tea Party” is a reference to the Boston Tea Party of 1773, a protest by colonists who objected to a British tax on tea. Dressed as Native Americans, demonstrated by dumping British tea into the harbor; the tea was taken from docked ships. The British taxation led to the revolutionary War of Independence in 1776. Besides the hardship of taxes on hardworking people who were merely trying to survive, there was the fact that most colonists were God-fearing, devout believers in the Bible who had escaped Europe’s religious persecution. They identified with the Hebrew prophets who also had been persecuted and overtaxed by the Romans during those Biblical times. Thus, one of the main messages in the Bible is that taxes are evil and must be rejected. Tax exemption on religious institutions in America is a law and a tradition. The issue of taxes has remained the most important one in every American political campaign in addition to abortion or women’s rights. The Christian pro-life issue is another Biblical misinterpretation derived from the prophets’ advice to “choose life” when referring to reincarnation principles. Thus, Christianity in America has been at odds with the liberal-democratic, part of the government system that protects human rights and taxes the wealthy to help the less-fortunate. The Church believes it should be the only recipient of public charity and thereby, the only authority assigned to provide the moral values and needs of the downtrodden. They are also afraid to lose the tax exempt status, now that most of them have become millionaires, such as the Evangelists. Every time a Democrat becomes president religious fears intensify, especially with the election of the first black president. The Boston Tea Party occurred December 16, 1773, at 11:00 pm, in Boston, Massachusetts. The Tea Party movement was originally registered as ChicagoTeaParty.com in August 2008 by a radio producer for a conservative talk show host. On February 19, 2009 (time unknown), after a broadcast rant against the Obama administration, the video of his tirade became a YouTube hit and thus the movement was officially born. Appropriately born with a Virgo Ascendant that represents the working people, this Ascendant is conjunct Neptune-Saturn-North Node and part of a dynamic T-square with the Sun. It depicts people of fundamental beliefs under hardship conditions who were willing to do whatever it took to achieve independence. This is supported by Mars-Mercury square Jupiter. Neptune in the picture explains the disguise as American Indians. The Grand-trine from Uranus and Pluto to the Virgo conjunction made it all possible. The Uranus-Pluto cycle always marks the time for major social, political, and economic changes. Placing the chart of the new Tea Party outside the chart of the Boston Tea Party shows the amazing connections between the two, suggesting that one picks up where the other left off. Saturn, again in Virgo, opposite Uranus, triggers the original dynamic T-square in the Boston Tea Party chart, while Pluto also triggers it by its conjunction to Mars-Mercury, square Jupiter in the Boston Tea Party. The conjunction of Mercury-North Node-Jupiter-Mars in the Tea Party chart conjoins the Moon and Venus of the Boston Tea Party chart. 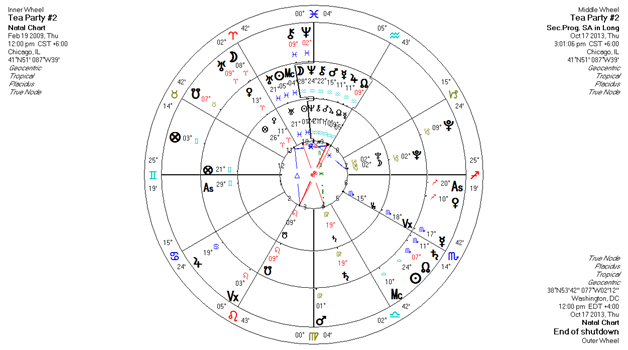 The fact that the new Tea Party has the Sun in Pisces with Neptune square the Boston Tea Party Uranus indicates different and nebulous motives and purposes are at play. Contrary to the first Tea Party that was united on a single purpose, the new movement adheres to multiple conflicting purposes creating confusion and uncertainty. The majority of followers are only motivated by religion (Evangelical Christians) while remaining attached to the Republican Party. Other followers have been misled into thinking the movement is strictly about eradicating government corruption; others are simply Libertarians against any type of government; and yet, others are also deluded into thinking they could use the movement to form a new and more progressive political party. This will be better understood after analyzing the impact of the Tea Party on the Republican Party. Before the Republican Party came into existence, there were Democrats and Whigs. The first public meeting where the name “Republican” was suggested for a new anti-slavery party was held on March 20, 1854 in a schoolhouse in Ripon, Wisconsin. The time is unknown, but 12:00 pm always works well on non-human entities, such as organizations, cities, etc. This party came into being under the platform of the non-expansion of slavery, a purely Northern major political party positioned squarely against the Southern slave power. Southern states held a grudge by remaining Democrat, which lasted until the Kennedy administration and the Civil Rights movement when they shifted to Republican. Sun, Venus, and Neptune in Pisces could testify to the original compassionate purpose against the oppression of slavery, but Neptune square Sagittarius Moon shows misguided idealism, and a conflict involving philosophies and beliefs. The mutable Grand-cross involving Venus, Mars, Saturn and Nodes, indicates duality of intention and purpose. The paradoxical nature of Pisces can be highly empathic, as well as deceptive. Pisces can give the wrong impression because it’s never what it appears to be. It is also prone to confusion and fear of disintegration, and thus in order to feel secure and in control it can desperately latch onto anything that represents power. Hence, Pisces finds refuge in religion through which it can also actualize the need to create fantasies, illusions, and delusions, in the search for meaning and purpose. The Republican Party was also given the name “the party of business.” This is explained by Saturn trine Jupiter, the aspect of high ambition and business success, in the productive and conservative signs of Taurus and Capricorn, indicative of support to and from wealthy industrialists. These were the business moguls that sought to benefit from the cheap labor that freed slaves from the south represented. The fact that the Tea Party has taken over the GOP is clearly confirmed by placing the planets of the Tea Party around the Republican chart. The Sun of the Tea Party in Pisces, conjunct GOP’s Venus, triggers the mutable Grand-cross bringing new light to the party by stimulating innate mental, religious, and philosophical vulnerabilities. The Saturn-Uranus opposition (2008-09), that gave the Tea Party the initial impetus to organize forms a T-square to the GOP Moon indicating emotional tensions and stresses in the process of unifying forces. The Aquarius stelliun of five planets and North Node impacting the Republican eighth house of joint values, resources, and taxes, depict a diverse group of revolutionaries determined to drastically change these matters. They also gave the GOP the new name of “Social Conservatives” (a new disguise for Evangelical Christians) although nothing could represent the term social conservatism better than this Aquarius stelliun that includes Jupiter. The T-square from the Aquarius stelliun to the GOP Uranus-Pluto is a major challenge to the old values, as it forces a new joint venture. The success of the joint venture is explained by two favorable Grand-trines between the two entities (ease, luck, support, rapport): The Tea Party Moon-Pluto conjunction, trine GOP Mars and Pluto (unifying influential power lays the groundwork toward major transformations), and the Tea Party Saturn trine GOP Jupiter, and Uranus (ambitious and optimistic changes for mutual benefit and advancement). The charts confirm what has been obvious so far; the great majority in the Tea Party and the Republican Party make a formidable team for mutual benefit. They share the same objectives to repeal Healthcare reform, they share the same basic ideological principles in favor of limited government ruled by the Bible, and corporations ruled by themselves. The rest of the people are on their own, perhaps at the mercy of the church (the way it was before the Great Depression). However, once the rest of the diversified followers realize they don’t share the same backward ideology and objectives, the numbers in the Tea Party movement will diminish. From 20011-13, transiting Neptune is conjunct the Sun of the Tea Party and the Venus of the Republican Party activating the mutable Grand-square they both share. Neptune’s magical dust of deception will continue to be poured upon them ultimately leading to disappointment and disillusionment. Meanwhile, wacky Uranus conjunct the Republican Mercury will continue to entertain with its theatrical and outrageous charade of GOP/Tea Party characters. At the end of 2012, Saturn in Scorpio begins to square the Aquarius stellium, thus pulling its reigns on all the Aquarius planets of the Tea Party for about two years. In addition, the mighty Uranus-Pluto square that promotes revolutionary changes by forcing disengagement from outmoded structures, will be affecting the Venus (values) of the Tea Party until 2015. By this time, Saturn at 27+ Scorpio begins to instigate a turning-point for the Republican Party with the opposition to its natal Saturn, just before it gets to Sagittarius and begins to activate the mutable Grand-square. At this point, Saturn also begins to square the Sun of the Tea Party. Up to this time, the movement might be able to retain its influential power over the GOP, other than that, it looks like Saturn will finish the job thus the days are numbered for the Tea Party. UPDATE: After running a campaign of lies, deception, and religious implications threatening Women's Rights and favoring the very wealthy, the Republican Party lost the 2012 elections. The self-delusion and denial promoted by transiting Neptune conjunct natal GOP Venus, conjunct Tea Party’s natal Sun, and conjunct the composite Sun between their presidential team (Romney-Ryan), left them in a complete state of shock. They had expected to win by a landslide. The GOP/Tea Party was expecting an illusive victory all the way to the end. They were so consumed by the Neptune effect they could not accept facts or failure. The Tea-Evangelical Party is still in control of the House of Representatives thus when standing for religious principles there is no compromising. They still hope to dismantle the democratic system of government. Thus, while the Tea Party's objective is to protect the power of religion over the people, the GOP's objective is to protect corporations and the wealthy. But, If the GOP expects to hold on to power, they will have to separate from their extreme ideological partners. This won't be easy as long as they remain under Neptune's self-delusion. In the mean time, the Democratic Party will have to fight harder to protect the general public. The masses are no longer willing to be repressed or oppressed, especially by outmoded religious/authoritarian regimes. On October 1, 2013, the same day the Affordable Care Act was scheduled to begin, the Republican Party led by the Tea Partiers revealed their true colors when they shutdown the federal government demanding to defund or delay the health-care law. The far right doesn’t believe President Obama or the Democrats have any right to govern at all, thus they deem perfectly acceptable refusing to raise the debt ceiling to undo the results of democratic elections. In their ideological crusade to dismantle government and deny affordable health insurance to millions of Americans they held hostage the national economy until October 17, 2013 at an estimated cost of $24+ billion. While they sabotaged the health-care reform, and affected basically everyone by damaging the economy, and put nine million mothers and children at-risk of starvation and death, these congressional bullies continued to receive their salaries and other privileges. The previous shutdown of 1995-96 during the Clinton administration cost around $2 billion in today’s dollars, not including the lost value of work or the $300 million the federal parks would have taken in, or the reduced pace of IRS audits. So called Conservatives, who constantly complain against federal food assistance programs for the hungry don’t seem to be in the least concerned about the loss of revenue brought about by the unnecessary government shutdowns, especially when a democrat occupies the White House. Those who pride themselves as “patriots” don’t seem to care how much they hurt the country, as long as they hurt the Democrats. After the madness of the past few weeks congressional lawmakers negotiated a last-minute plan to reopen the government and raise the debt ceiling, as the U.S. averted a historic default on its debts for the first time in history. It is obvious to astrologers that transiting Saturn at 11 Scorpio, positioned at a sharp 90 degree angle, square to the Tea Partiers’ natal and progressed Mercury, N/Node, Jupiter, and Mars in Aquarius was the catalyst that forced the GOP to surrender, and transiting Mars opposite natal Sun triggered the action. (See chart at end of this article). The natal Aquarius stellium of planets in the 9th house (law and religion) is evident of a new breed of angry rebels taking up where the Old Confederacy left off. In 1860, it was the end of slavery that the rebel states feared; today it is universal access to health care. The resentful whites who make up the Tea Party view themselves as besieged by minorities seeking free benefits threatening their way of life. It is no coincidence that states most opposed to Obamacare are also instituting voter ID laws designed to keep poor minorities from voting. To the soldiers of this New Confederacy the Civil War never ended. Transiting Saturn square to all the planets in Aquarius will continue to hold back the Tea Party’s racist hysteria from fulfilling their goals throughout its sojourn in Scorpio until 2015. The struggle will continue as Saturn goes into Sagittarius 2015-17 and begins to square the natal Sun and Uranus. Meanwhile, from November 2013 to the summer of 2014 the progressed Moon will be conjunct the natal and progressed Sun, which are still under Neptune’s magical dust of deception. This aspect promises to intensify the delusional religious zeal of the Tea Partiers and promote the initiative of a new scheme. The conjunction from transiting Neptune to the Sun of the Tea Party and the Venus of the Republican Party has been the contributing factor for their delusional and misguided intentions and actions. The main characters among them truly believe they are on a special mandate from God to bring down the U.S. government as the final requirement to “the end times” and Jesus’ return. The health-care reform debacle is simply the smoking gun to camouflage their true motivations. The Tea Party’s ideological crusade will continue because religious zealots never compromise and never give up. Due to their attachment to the GOP they could remain in office in 2014 by their misguided followers and the scheme of redistricting, but their power will continue to dwindle by the limiting and adverse effects brought about by the Saturn squares. The Grand Old Party is confronted by a great dilemma; either they take back control of their party and readjust to the social demands, or they may go down together with their extremist counterpart. Spending on social programs is not what’s destroying the power of the USA; the corporate monopoly that favors the greedy 1%, buys politicians, sends jobs overseas for higher profits, and destroys the environment is more to blame – these are the real enemies of America. All empires come to an end after unnecessary over-reaching and over-extending of power. The Iraq War-occupation did more damage to the country in terms of spending and creating more enemies than any social program ever could. Presidential election 2016 heralds turbulent times as the Tea Partiers and Republicans struggle for power. The party of big business can’t wait to finish the job of handing over to the corporations what’s left of government. They will pull out every trick in the book and do whatever it takes, knowing it might be their last chance before the masses wake up and demand justice. Unfortunately, matters have to get very bad before people are ready to react. The GOP has been on a relentless quest to undue “The New Deal” ever since President F. D. Roosevelt signed it into law. In 2020, the USA will experience a major political turning-point with the Jupiter-Saturn-Pluto conjunction activating the natal U.S. Pluto in Capricorn. Pluto’s first return to its original position since the Revolutionary War of Independence from the British/Christian monarchy in 1776 will mark an epic time in U.S. history. Pluto in Capricorn gave USA the system of self-government that created the most successful and wealthiest democracy in the world. This system has been corrupted and is no longer “by the people and for the people, with liberty and justice for all.” The question remains, will the American people be ready to take back their government from the new corporate/Christian monarchy? If this new monarchy has its way, they will do away with social security, health-care programs, and the churches will be in charge of the basic social services. However, USA and the new world are not supposed to go backwards against the forward forces of the universe. Pluto’s return will promote a turning point, while at the same time, transiting Neptune will weaken the power that leads the new monarchy, with its first conjunction to the Sun of the Republican Party since it was established. The energy of Neptune promotes lessons in humility. Its effect is nebulous and slow, thus by the time the unenlightened souls notice, the rug has been pulled from under them in order to make room for more sympathy and humanity. The future of Capitalism is uncertain as the Pisces Age of religious persecution and victimization is coming to an end. People power will supersede the worshiping of lords and masters. No one will be able to stop the age of social humanism that’s at hand; either we all progress together or we will all perish. The universe demands the kind of change that moves forward, thus new progressive forms of government are in the horizon marked by Pluto’s official ingress into Aquarius (2024) that precedes the beginning of the New Aquarius Age.